M. Night Shyamalan’s new film is less about character development and the telling of a good story than is about contending theories concerning superheroes. Samuel L. Jackson, James McAvoy, and Bruce Willis star in M. Night Shyamalan's new film "Glass". A scene toward the end of M. Night Shyamalan’s new film, Glass, occurs in a comic book shop in which an episode of the old Adam West Batman TV series is playing. The campy tone of the TV series makes for an illuminating commentary track on Shyamalan’s film. 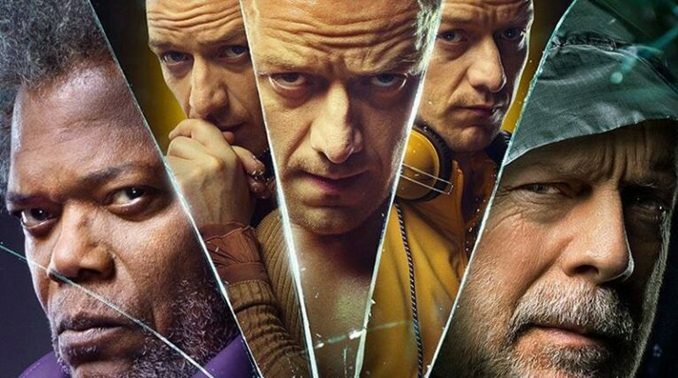 The famed director’s most anticipated film in well over a decade, Glass is a disappointing film, which comes off as unintentional camp masquerading as a profound reflection on the capacity for human greatness. Glass is the finale of a trilogy, the first film of which is Unbreakable (2000) and the second of which is the much more recent Split (2016), which marked a revival in a writing/directorial career that had taken a dive around the time of the release of The Village (2004). Split features a remarkable performance by James McAvoy (Kevin Wendell Crum) as he juggles, in disturbing shifts from humorous to menacing and from child to adult, some 23 (perhaps 24?) personalities. There’s also a clever plot element in Split that heightens the suspense, namely, Kevin’s regular visits to a psychiatrist who is aware of all the personalities and increasingly worried that the most violent of the personalities is gaining control. Will she figure things out before it’s too late for the female hostages? At the very end of Split, Shyamalan hints at a connection, beyond the Philadelphia setting common to so many of Shyamalan’s films, to his early film Unbreakable, which was a mediocre box office performer but has become a cult favorite. The existence of The Beast, Kevin’s 24th personality, a character with superhuman powers, seems to confirm the thesis of Mr. Glass (Samuel L. Jackson) from Unbreakable, whose own physical fragility seems to mark him as a mistake, an outcast in a world of ordinary, healthy human beings. Glass’s purpose is to discover whether there are other, extraordinary human beings, perhaps at the other end of the spectrum from him. Through a series of malevolent and macabre tests he discovers David Dunn (Bruce Willis), a seemingly ordinary family man with untapped physical prowess. If his antithesis exists, then, says Glass, his own life must have purpose. Glass picks up years later than the action of Unbreakable but just months after the conclusion of Split. With his darker personalities now ascendant, Kevin has kidnapped a group of young cheerleaders. Dunn, now working with his adult son whose belief in his father’s superhero status was an important theme in Unbreakable, spends his time walking the streets of Philadelphia looking for evildoers. In a standard motif, the police are hunting for him as an allegedly lawless vigilante. He soon encounters Kevin and his hideout. He manages to free the girls but in the ensuing fight with Kevin’s Beast personality, they are both arrested and taken to a psychiatric prison, where Mr. Glass is also incarcerated. Dr. Ellie Staple (Sarah Paulson), the psychiatrist in charge of the institution, specializes in patients suffering from delusions of grandeur, particularly those afflicted with superhero syndrome. Her task, it seems, is to cure them of their delusions through therapy, medication, or surgery. The scenes featuring Staple are drawn out and dramatically flat; the psychiatrist role here is much less interesting than it is in Split. In a vintage Shyamalan plot twist/revelation late in the film, her covert motives are revealed, but the revelation doesn’t make the previous scenes any less tedious. When it comes to psychiatric drama, Glass is no One Flew Over the Cuckoo’s Nest. Staple’s character is one of the weaknesses of the film; Kevin’s is another. He continues to dominate the screen as he had in Split. But his performance here adds nothing new. It’s just more of the same and subject to the laws of diminishing return in entertainment value. On one level, the film builds toward a confrontation between Kevin’s Beast and Dunn’s vigilante as a conclusion to the battle interrupted by the police at the outset. But their contest is thoroughgoing camp. With characters simultaneously watching their battle and attempting to interpret it in accord with the motifs of comic books, Glass enters the realm of self-parody. It calls to mind the Scream films, in which characters in a horror film invoke tropes of the horror genre to understand what is happening to them, yet those films were intentionally, if darkly, comic and spared us deep reflections on the mysteries of human life. Now, Shyamalan has often been quite successful at asking probing questions in his films. Particularly in his early films, he offered stylish and subtle presentations of the mystery of evil and the struggles of ordinary individuals, tempted by despair, to thwart evil and defend the innocent. These issues are barely present in Glass. Part of the problem is that the film comes too close to dissolving the problem of evil in its suggestion that bad guys are just victims in need of therapy and love. But, as Walker Percy puts it in Lancelot, in a world where everyone is either nice or sick, evil no longer exists. But then Glass, it turns out, is less about character development and the telling of a good story than is about contending theories concerning superheroes. It doesn’t take much imagination to realize that Staple’s vision and task are the polar opposite of Glass, whose amoral destruction has as its goal the discovery of someone at the other end of the spectrum, his complement, a superhuman. Now, with Kevin Crum joining David Dunn, there are two. Might there be more? Shyamalan’s shockingly vapid answer is, “we’re all superheroes now,” or at least we soon will be if we can just believe in ourselves and in the power of social media to communicate unvarnished, unquestioned truth to the masses and thus unify them. Unbreakable operated at the edge of the superhero genre, while Split was on the periphery of horror. The genius of Shyamalan was to infuse clichéd genres with complicated human characters and elements of suspense. In Glass, those elements are no longer present, leaving only a vacuous and generic new age self-help fideism. Thomas S. Hibbs is Dean of the Honors College at Baylor University. His most recent book is Wagering on an Ironic God: Pascal on Faith and Philosophy.